Installatron the MOST VERSATILE auto-installer. Install any application, on any control panel. 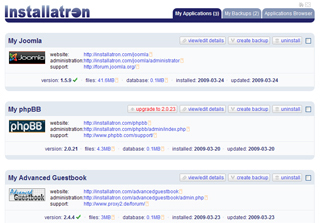 Installatron is one of the most popular auto-installers. Supporting over 65+ open-source scripts, Installatron license also can be installed on almost any control panel making it an ideal choice for hosting providers and resellers. Are you using a custom theme, or perhaps a theme installed with RVSkins? If so, you'll be glad to learn that Installatron will work with it, right out of the box. No other auto-installers can provide you with that level of integration like Installatron! When it comes time to update your auto-installed application, Installatron license makes it easy. Installatron automatically downloads new products and updates on a daily basis via cron, ensuring that you're always up-to-date. Have you ever wanted to install an application right as you open an account? Installatron's API will allow you to do just that. Have a custom control panel? Just use the API to get Installatron integrated. Installatron contains a truly unique feature which allows administrators to make their own software and place it into Installatron for customers to be able to install with a click of a button.